No "Dog and Pony Show", just results! Let us do for you what we've already done for these Sellers. This Contemporary Colonial on 25 Acres with 22 stall barn and indoor arena, sold to a neighbor who had admired it since its inception. They will operate it as a commercial boarding stable. Minutes from the 2nd oldest Fox Hunt in the Country. This beautiful Circa 1830 home on 15 acres, purchased by an Amherst, NY couple to enjoy quality family time. With covered arena and 19 stalls, sold to Wilson Training and Bloodstock Farm from Lake County Florida. Additional stalls will be added to accommodate their many clients. With a ½ mile track in Attica, NY was purchased by a local couple who will build an Indoor and Outdoor Arena, offering to the community a Multi-faceted Equestrian facility. Now has a new owner. This Gal from Menands, NY can now fulfill her dream of having horses on her own property. WARNER, NY EQUESTRIAN FACILITY OPERATING IN THE BLACK, with 28 Stalls and a 62x200 Indoor arena, was purchased by family enabling them to fulfill a lifelong dream of owning and operating a commercial Horse Farm. With 36 Stalls, 70x175 Indoor Arena and a 2 Family Home was purchased by a local couple. They will continue to follow the successful program of the previous owner. A family from England purchased this 5 bedroom, 4 bath home on 50 acres with a 36’x60’ stable to enable them to continue their active interest in the NYS Standardbred racing program. A New York husband with a Texas wife purchased these DeRuyter NY 49 Acres with a log home and 6 stall barn, so she could have horses again and they could be close to his family. 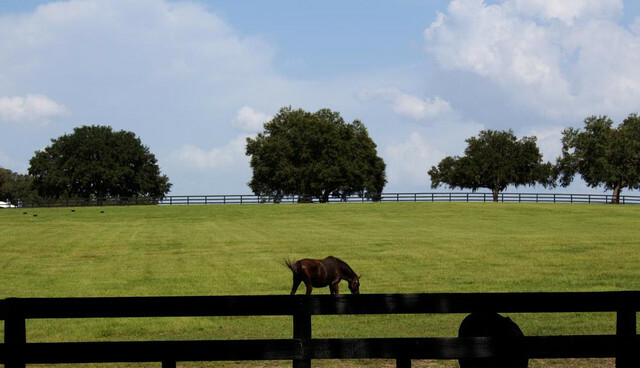 Liberty Stud, a 211 Acre Horse Farm located in Ghent, NY Columbia County: This beautiful Thoroughbred Breeding farm was purchased by a New York City Attorney, planning to continue participating in the Thoroughbred Racing Industry. Near Racetrack/Casino 20 Stall Stable, Indoor arena, breathtaking Apartment with 3 Car Garage, and 72’ Deck overlooking the 35 Acres. Purchased by a Long Island couple to operate for Boarding, Retirement and Layups. 16 Acre Country Retreat Horse Farm, with Beautiful Views, magnificent landscaping, high above a river, where they can have horses of their own was their childhood dream. Has been sold to a local couple who works in the area, and can now enjoy having their horses at home rather than boarding them out. Nationally Known Stables in Cazenovia, NY: Purchased by a Partnership whose motto “For The Love Of The Horse,” will offer Boarding, Lessons, Training and Sales dedicated to a better understanding between people and horses. 13 Acre Hobby Farm in Middleport, NY sold to a couple from Albion, NY combining 2 households. This property will become their personal residence for the newly expanded family, including their 3 horses. O'BRIEN'S STABLES MORAVIA, NY with Indoor Arena, 24 Stalls, 94 Acres adjoining 2,400 Acres of State Land, sold to a local resident who will operate it commercially, offering lessons, boarding, training and trail rides. Horse Farm in Weedsport, NY has been purchased by a family from S. Dakota. They will be Boarding, Training and Breeding for the purpose of participating in the NYS Standardbred Breeding program. Cooperstown Region ​$1,750,000 Farm purchased by a Pennsylvania Family; to become a B&B. Offering superb dining, horse boarding, trails, tennis, and a unique country experience for their guests on a private 200 Acre Estate. 8 1/2 Acre Horse Farm in Freehold, NY, now has a new owner. This Gal from Menands, NY can now fulfill her dream of having horses on her own property. 120 Acre Horse Farm in Princetown, NY with a home and small stable; offering 2 beautiful ponds, meadows and endless wooded trails was purchased by a Gentleman from Glenville, NY to be used as a Family Compound. Enchanted Acres Farm in Deansboro, NY farm house for wo​rkers, 66 x 200 horse barn, 21 stalls, on 66 acres recently purchased by a couple from Garden City, NY to create a premier equine retirement and sale farm. ​Canajoharie, NY; Attractive Ranch Home on 33 Acres with 60x120 Indoor Arena. Sold to a Connecticut couple, who plans to operate this as a family friendly boarding and lesson Stable. ​Historic 1820 Colonial Home and barn with 9 acres in Ft. Plain, NY originally part of the General Cochran Farm. Purchased as an investment by a New York buyer. Successful operating horse farm in Burt, NY with 12 Acres, a 60x120 indoor arena and 28 stalls, was purchased by a family from Canton, NY as a commercial venture. This 1880 restored equestrian estate on 54 acres, in Jordanville, NY once owned by movie producer, Jerry Shatzberg, was purchased by a couple from Sagamore Beach, MA to raise Thoroughbreds and enjoy the lifestyle. ​15 Acre, Highland, NY horse farm, with 13 Stalls, located only 75 miles from NYC. Purchased by a NYC client for a personal retreat and small business venture. This 55 Acre Horse Farm with its 80x200 indoor Arena located Near Saratoga, NY has been sold to a couple from Virginia. They will be offering boarding, training, lessons, and horse shows to the public. purchased by a family from Connecticut as a personal paradise for them and their horses, allowing them a new life style long dreamed of. ​​Binghamton NY 18 Acre Horse Farm, Sold to a local couple with a successful Landscaping Company, so they can combine their business with their love of horses. They will continue maintaining it as a local boarding facility. Hobby Farm in the Finger Lakes Region was purchased by a local couple for a personal residence, and the infinite pleasure of merely walking to the barn instead of driving to a boarding facility every day. 19 acre property with a 72x120 indoor arena and 8 stalls plus a separate barn with 9 stalls plus large storage area and older home was recently sold to people from the Albany NY for personal use. A good opportunity for them. This beautiful country estate just outside Cobleskill including a great pond and several barns was recently sold to an area couple for their personal use. Near Cherry Valley, NY This is truly one of the better properties we have had the opportunity to represent. This outstanding property was purchased for a family operation. This outstanding Equine facility near Schenectady NY was recently purchased by clients from Virginia and they will establish a full scale equine operation including sales, boarding and lessons. Quality operating horse farm in Greene NY was recently purchased by a family from Pennsylvania for a family operation and will be establishing a boarding, lesson and sales facility. Equestrian Facility near Utica was purchased by a family from Virginia and they plan to enjoy it for a family size horse operation, 200+ acres, beautiful home and newer indoor riding arena facility with stalls Hobby Farmette near Lake Ontario Sold to empty-nesters looking to get closer to their grandchildren. Wouldn't you like to see your property here? Contact us to get your Equine Property Sold! Massive Historical Estate with over 20 acres between Buffalo and Rochester, NY Sold to a young, growing family, looking to raise their children on an operating country farm. Modern House w/ Barn and Tillable $199,900 Suburban Family goes country at this farmette, utilizing the tillable as well as stalls.